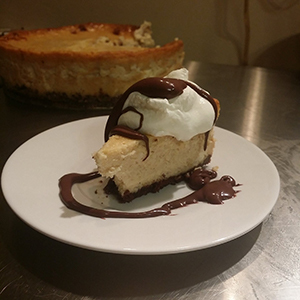 This is a cinnamon vanilla cheesecake, with a Mexican chocolate cookie crust, chili chocolate ganache, and marscarpone whipped cream (or regular whipped cream). I make the cookies according to the recipe linked above. They come out very crisp, which for this is exactly what you want. If you read the comments with the recipe, they're expecting something different. Crushed cookies should be about 1 cup. Mix cookies, sugar, melted butter together until mixture looks like wet sand. Grease springform pan with melted butter and press cookie mixture into bottom. (I used an 8 ½ in one, a larger one would work but would make a thinner cheesecake which would take slightly less time to cook.) I use a small ramekin, but your hands work too. Press hard, it needs to be firm and even. Bake at 375 for 12-15 min. Mix cheeses together with mixer or wooden spoon. Cream in sugar, vanilla and cinnamon. Mix in eggs, mix until well combined and few/no lumps of cheese. Brush sides of crust pan with melted butter. Pour in filling mixture. Bake at 500 for 10 min, reduce heat to 250 (don't open oven!) and bake 90 min more or until center tests 150. It should rise, and be slightly browned (edges will be browner). It should jiggle when touched but not be runny. (Don't worry if it cracks, we're covering it anyway). Let cool at room temperature, then refrigerate until cold. It will sink as it cools, this is normal. Chill the bowl and beaters. Everything should be cold, straight from the fridge. Beat cream until soft peaks form. Add marscarpone and a most of the confectioners sugar, beat until stiff peaks form. If you want it sweeter, you can fold in the rest of the sugar at the end. Put chips and chili powder in glass or metal bowl. Put cream in saucepan, bring to boiling. Pour over chips let sit for a minute to melt. Use a whisk to blend until smooth. Chill. Spoon whipped cream over cold cheesecake. Drizzle ganache over top. Or spread ganache over cheesecake and spoon whipped cream on top.